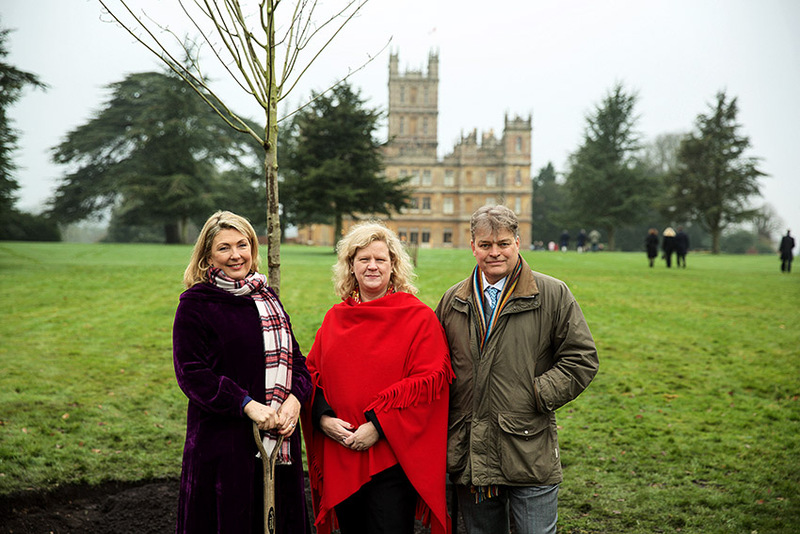 Over the past centuries all those who have lived here at Highclere have planted trees. You can walk under them, shelter under them, gaze up into them, listen to the birds and then try to spot them. If you walk in the woods you can sense the whispers of the trees and the leaves , they are beautiful and give us a sense of peace. You can kick through the leaves, use the fir cones and collect the firewood, whilst fruits and seeds like hazelnuts, walnuts and almonds support our health. You can trace the furrows of time in the depth in the bark with your hands, or link arms around a tree with friends. Their roots stretch further than you think and through their roots and leaves they anticipate the future weather and prepare for it. When we harvest it, wood provides our doors, windows, structural beams, furniture and fittings; wood carvings are in every room and on every door of the Castle. 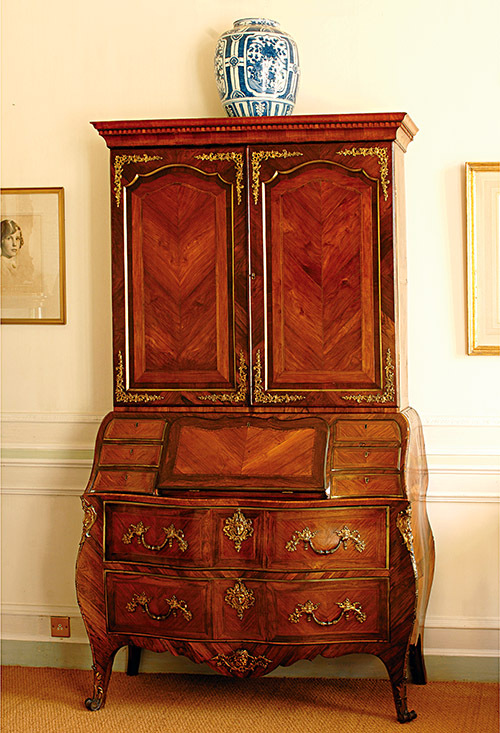 The wood was carefully chosen by Pierre Langlois to create and craft a bureau 250 years ago. 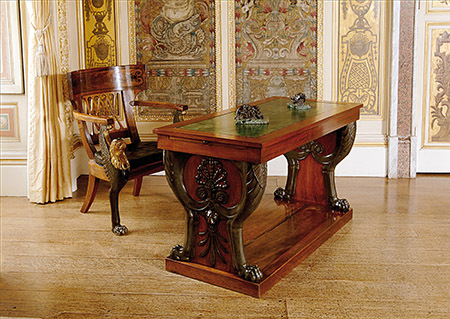 Jacobs Frere used mahogany to create Napoleons’ desk which now sits in the Music Room. There is the stump of an old cedar tree near the entrance to Highclere Castle and, if you sit and count the rings, you would find as I did that it must have been planted in about 1780. Jane Austen was five years old; the French revolution was still nine years in the future, as was the unanimous election of George Washington as the first President of the USA. As this tree grew, it saw the Age of Reason turn into an unprecedented era of industrialization. 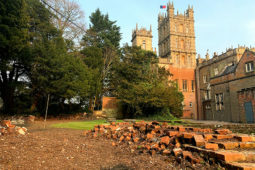 Highclere has a long history of forestry going back to Bishop William of Wykeham who built a palace at Highclere, planted an orchard and felled oaks from the Estate to build two educational colleges: what is now the school Winchester College and then New College, Oxford University. During their tenure here, the Earls of Carnarvon have collected trees from all over the world and brought them back to wonder and admire. In recent times, Geordie and I have created an arboretum and planted a walnut walk. We have now been given a very special tree. On John A. Macdonald Day, January 11th, the High Commissioner of Canada Janice Charette, joined us to give and plant a red maple tree on the lawns in front of the Castle to celebrate Highclere’s connection with Canada. It is on both Canada’s coat of arms and flag, suggesting strength and endurance, in fact we flew their flag above the Castle. Naturally we then retired inside for afternoon tea. I had found this story of the creation of the constitution of the Dominion of Canada whilst researching my last book “At Home at Highclere”. Looking through the old visitors books, I will never know what made me choose that page with the founding fathers of Canada‘s signatures on. It was the start of an amazing journey and I find it hard to explain quite how much it means to me to be a small part of this history. The High Commissioner and my husband both said a few words. Chaplain Tim Novis blessed the tree and thus the friendship and then I tried to say a few words in French (my accent aided in advance by my number six sister and her husband). Je suis tres honorée de vous accueillir ici et je suis ravie de ce magnifique erable. Merci beaucoup pour ce cadeau. Highclere est un lieu d amitié et de convivialité. John A. Macdonald, Georges Etienne Cartier, ainsi que d autres pères fondateurs, avaient senti qu’ils avaient trouvé en Lord Carnarvon un veritable ami et j’espere que tous les Canadiens aujourd’hui sentiront qu’ils vont trouver une maison heureuse de les accueillir une fois de plus et de célèbrer la naissance de leur pays. Very interesting, and very nice gift of the tree of Canada. My husband is a cabinetmaker and seeing those wonderful furniture made by good hands is a delight. You have great and very special works in the castle, which we are lucky to be able to show you so that we can admire them. I love the blog. How beautiful, trees, friendship, life…and your very lovely words in French. We read with great astonishment last year about the role Lord Carnarvon and Highclere played in shaping our wonderful country. It is a reminder that together we can change the world! Bonjour and what a lovely and enduring way to honor Highclere’s important connection to Canada for generations of future historians. The well written and well told stories you share, illustrated by the lovely pictures, are sure to peek their interest just as they do ours. Thank you. May the new friendship grow as strong as the red maple that you planted. 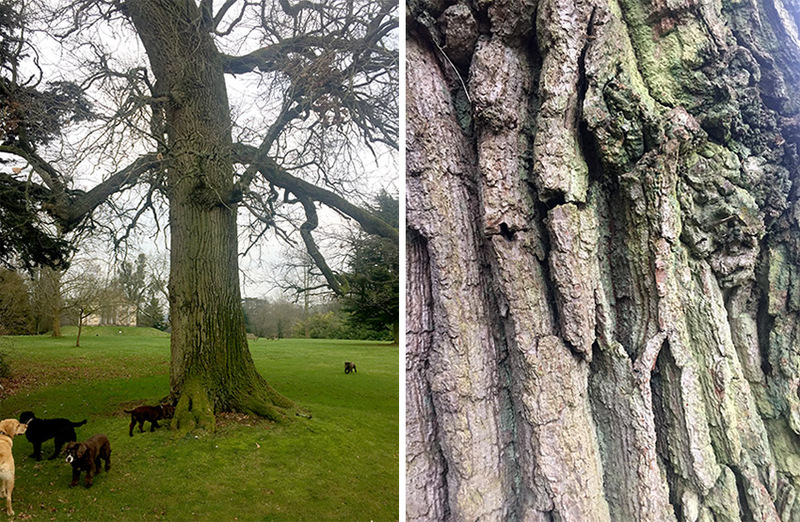 The trees at Highclere are truly beautiful, remind us of the history that has passed, and the gorgeous furniture and doors are their gifts! I live among many trees and I feel they are like friends. Makes me sad when one has to come down. Thank you for your lovely photos and words. I always look forward to your blog. My husband and will visit Highclere in July and I keep telling him I want my picture taken in front or under one of those huge fir trees. I hope we get to spend sometime walking the grounds, having tea and seeing the house. How kind you are to offer – I have a Wood of Goodwill in which I am gathering trees and shrubs from friends old and new. 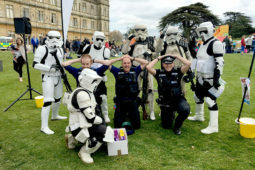 However due to too much generosity I try to gather themes or groups of people together for example around the Heroes event in September when we are trying to help those who save and those who serve. You are very kind. Well, what a lovely (and genuinely interesting) posting. first governor of the state). Unfortunately, three of the twelve oldest and hugest trees (one of which was the oldest, if not the largest, in the state) have committed suicide over the past two years……just toppling over for no particular reason in the middle of a perfectly sunny day. Miraculously enough, all of them fell AWAY from the house….or I wouldn’t be sitting here in the kitchen wing, typing away at you. I was. as you would guess, very sad/depressed about each loss (the trees were, indeed beautiful. and I won’t be around to see their replacements mature). That said?…..there was quite the silver lining to each tree’s demise. I’m a painter and, so, belong to a couple of artist and craftsman’s guilds, to which a number of fine woodworkers also belong. Quite frankly?…..it was going to cost between two or three thousand dollars simply to have each tree removed from the property. Ouch, to say the least. I’m a successful painter, but I don’t yet fetch Damien Hirst prices. Instead?….I simply contacted the guilds, asking if any of the well-known woodworkers/furniture makers wanted a free-go at three enormous, 200 year old pecan trees. I had to pay only about one thousand dollars to have the brush taken away. historic visitor’s center, and, for now, it’s nice to think that all the rest of those trees will end up as furniture, bowls, and other art that ends up in various folks’ homes. All in all?……a much finer end for some very beloved trees than being sent as trash to the county landfill. Thanks again for your own, equally optimistic story. A lovely post, thank you ! When we had a house in England there were many maple trees in the garden and they were such a joy when they turned color after the first frost..I am sure you will enjoy yours as well. My children loved playing in the leaves. I have a huge tree stump in my Texas garden that was obviously the twin of the old oak tree but part was cut down to build this house . I am going out to count the rings as I suspect it is quite old… this house was built on virgin woodland and our garden is one of the few with old trees left. I treasure them, but they cost a lot to maintain and I am up to my knees in leaves which I must go and clear ! I hope you can keep warm this winter ..big houses are good to look at and enjoy in summer… but awful in winter. Thank you for the interesting post. Thank you for your comments – do tell me when you have counted your rings!!! It was with great disappointment that our small group had to cancel our tour to your beautiful home on Dec 11th due to the snow storm. As a Canadian living in the Canadian North it would not have normally been an issue for travelling the snowy roads but not a chance to take in an unfamiliar country. I am back home now and the report of the Red Maple tree planting at Highclere made the national news! I have studied how the 4th Earl of Carnarvon was the mediator of the founding of our beautiful country of Canada! Such a proud heritage we share! I feel so overwhelmed, so fascinated and so honoured! I had read a book named “The Hidden Life of Trees” an international best seller, by Peter Wohlleben, a 53-year-old forester (having worked 20 years for the forestry commission in Germany) who now runs a 1,200-hectare reserve in Germany’s Eifel region. His presentation of the ability of trees to communicate is both romantic and scientific, and presents an absolutely fascinating world! I have yet to visit North America in the Fall! Since I’m from the cradle of the plant kingdom, and the nursery capital of the world, Warren County Tennessee, I love hearing about the tree at Highclere. The Red Maple will be a beautiful addition to the grounds. I can just imagine the fiery red-orange leaves in autumn laying on the chartreuse lawn. Wandering the grounds last December at Highclere, I saw some of the most amazing evergreens I’ve ever seen. Naturally the leaves of the deciduous trees had already come down, so the conifers were the kings and queens of the landscape. And yes there are male and female varieties of evergreens, such as the holly tree. Here in Warren County, we are particular fans of Foster’s Holly. I think it should be called Elizabeth’s Holly because it is a virgin tree that doesn’t require a male holly tree nearby to pollinate it. If you ever desire to honor Elizabeth 1 in your collection, please allow me to suggest Foster’s Holly. It has a beautiful conical shape, produces as mass of red berries each year, and seems to know it’s owner and their pruning habits after a year or so in it’s place. I have two that crown the corners of my home, that are home themselves to several families of cardinals. The spikey leaves keep the cats and other predators away, so throughout the year, I’m delighted with my cardinals everytime I look out a window. Today they have a snowy backdrop to perch upon, as they feast on an abundance of berries this year. I can tell by the berries on my Foster’s how cold the winter will be, so I only need the weather forecast for the outlook for tomorrow….more snow! Confidentially, I can say that I hugged several of the trees at Highclere because of their majestic beauty, all while wishing I had a week to share the love with so many more. I treasure the photographs I took of all the interesting trees at Highclere, and will be re-visiting that collection of photos today! Thanks for inspiring another fine morning Lady Fiona! You and your team make Highclere the gift that just keeps on giving! Another lovely blog, what a beautiful bureau too. The Maple tree was my late father’s favourite tree, I have one or two in my garden, they are so beautiful, especially in Autumn. I love how you refer to your number six sister! I think I will say that to my sister next time we speak. Is that a picture of her with you and your husband? Keep up the great works – I am lucky to have Canada as a neighboring country! It is the two of us and the High Commissioner of Canada, a very remarkable lady. My father numbered us, which I was fine with as I am number 1!!!! Thank you for your kind words. Where could I send in a offering to you for your cause? For my father who fought in WWII, could you have a theme such as ” Those who stood by Churchill”? For those who were in the war, from other country’s to be silently, and general honored, in a group setting! What I need is an address to send in some money, and the currency of your choice, for such a worthy cause. You are truly a very warm hearted, and a remarkably , kind lady, that this world needs! I await your reply! and if necessary please use my email address to send me a mailing address. They are working cocker spaniels – every day is a good day for them! Reading this is an absolute delight and the accompanying photos are lovely. My husband and I enjoy many species of trees and have quite a variety here in upstate N.Y. We’re certain that this healthy young tree will provide many decades of enjoyment. Our involvement with equine persuits have taught us that as wonderful as a red maple tree (or our beautiful sugar maple)can be as it grows to maturity, it is not a tree that one would plant in equine pasture areas, or any area in which horses might graze or be tied, as its leaves, like those of the wild cherry, can be toxic to horses should they ingest them. Have you had the privilege of seeing the wonderful trees of Canada in the autumn with their spectacular color? The tree was blessed as well, so it should do well. I agree re horses paddocks, they need to be well away. I have only visited Canada once to give a lecture in Vancouver for PBS and then there was a showing of a Downton episode in a theatre. It felt vaguely surreal to me – a sort of home from home! Will the ‘Highclere Castle and The Confederation of Canada’ booklet available for purchase on the website, please? Your words reminded me of a big maple tree in our garden when I grew up in St. Louis. My friends and I, and of course my dog, played in its leaves, diving into raked piles of them in the autumn. I loved to sit under the tree, too, reading my books which were never in short supply, and listening to the rustle of the leaves in the breeze. It has been many years since I lived there, but the maple tree holds some of my fondest memories. I’m very much impressed with your French! Thank you, it is a nice gesture to recognize we are officially a bilingual nation with many other cultural richness. I love maple trees and we have so much in the province of Québec, we are the number one for maple sirup, although we are getting competition from our friends in the north of the USA now. Hum, do I see a new project for your Lady Carnarvon? The culture of maple sirup and all it’s derived way to enjoy it? It could certainly fill a few pages in your next recipe book. Merci -I think I have been asked to give a talk in French in Canada – that is what Patsy who is my North American right arm – has been telling me! I will try but is with my sister Georgie and her husband’s help! Their French is pretty good. Of course – bien sur! How lovely are your words about trees. I hope that you will enjoy your red maple as much as we do ours. They truly are a highlight of the autumn landscape here in Ohio. I was interested to learn of the role Highclere Castle played in the history of our neighbors to the north. How wonderful that you continue to research and make new discoveries about the history of your beautiful home. Our family looks forward to visiting Highclere summer after next, as we tour England in celebration of our son’s 18th birthday. I hope I will be here. …..the reason being that, according to the older sister, “12” was the mental age at which Debo had become stuck. Appparently, Deborah was just fine with the nickname. Actually there were six girls…a remarkable family. I think any larger family does have a language or a shorthand which is peculiar to them! MERCI BEAUCOUP POUR CE CADEAU.LES ARBES SONT BIENVENEAU.HIGHCLERE CASTLE DEVIANT TENIR UN ARBRE TRES BELLE AU BRESIL LE FAMEAUX PAU-BRASIL . MERCI. LE ARBRE PAU-BRASIL CE LA CAESALPINIA ECHINACEA. 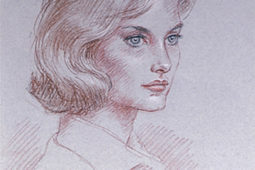 I first learned of Highclere’s connection to Canadian history via your blog last year. Then, in the summer, while visiting the town of New Westminster (named by Queen Victoria), now part of Greater Vancouver, I saw Carnarvon Street on several signs. Well, that piqued my interest and a little research revealed how Lord Carnarvon not only advocated for Canada, but also for British Columbia’s role in the confederation. Hence, a street named in his honour. Then I discovered that there’s also a Carnarvon Street in my town of Victoria, BC, on Vancouver Island. The Earl resigned his post as British Colonial Secretary in 1867 or so, in protest against one of Disraeli’s motions, but in 1874 again became British Colonial Secretary and mediated the dispute between Canada and British Columbia regarding the transcontinental railway that was promised if we became part of the Confederation. Thanks for bringing up this topic and inspiring me to research some of our own history. Thank you for your information and Lord Carnarvon was a strong advocate for the railway from 1866! We have various maps and reports and I have read about the discussions about which route to take. As a first generation born in Canada of a British father, I am thrilled with your ongoing commitment to keeping the connection between Highclere and Canada alive. I am graced with many majestic maple trees on my property and marvel at their bloom of colour every autumn. My father could not have picked a better country to emigrate to! Merci for the honour of Your maple tree. I hope to visit it in the future. As always…. Thank You for sharing! Where I live, in New Hampshire, US, we have Sugar Maples. It is quite a process to collect the sap and boil it down (which seems an eternity) to make the most wonderful syrup you have ever had! I hope you will have the chance to taste this syrup someday! Greetings! I met my cousin Jeannie Wallop after she married “Porchie.” My friend and I were “doing the grand tour” in 1956 when she invited us to their summer house on the south shore. Trained down and spent a hilarious night with them Her father, Sen. Malcolm Wallop and my father John “Jack” McGinley II met frequently in Washington. My friend and I spent a night with Malcolm in Wallop, WY the next summer as we headed to Alberta to work for the summer. I have often thought making an appointment to come by your Castle. Possible? On another subject, I have read your wonderful books on the family in my genealogy research. I had one difficulty which you might care to solve in the next printing: it appears many of the earls were Lord Porchester before they took the title. I seems they all were known as “Porchie” until they became the earl. For me it was difficult to keep straight which “Porchie” was which in your narrative. It was, nevertheless fascinating to read of the back history, generation by generation. Thank you so much for doing it. The courtesy title is Lord Porchester – although at that point the “heir” is legally a Herbert so I married “George Herbert – commonly known as Lord Porchester”. My personal view is that titles are earned rather than given in today’s world – I am working for Highclere, it does not provide for me, so it is quite inverse compared to pre 1939. The 6th Earl was very much called Porchey so in the book Catherine that was my shorthand whilst I kept with Carnarvon for his father… Jeanie again married a Porchie who was Lord Porchester for some time as his father lived until he was about 90. Jeanie’s husband was nearer 60. Incidentally I have just cooked supper for Jeanie tonight who was in excellent form and I was glad to meet Malcolm a few times. Jeanie is now Carnarvon and legally neither she nor I are either Herbert or Porchester. We are having a weekend on Sept 8/9 this year which will be special – it is on the Heroes at Highclere page on this web site. I very much hope that different nationalities will all be here and we will all join together to remember. Second thought: if you might have interest in my genealogy database going back to Liberty Emery Holden, my mother’s family, and beyond. Some 400 names and dates. I can send you a GED file of it, a universal genealogy format for computers. LMK please. Thanks for your kind reply. Most interesting. BTW the place on the south shore where we met in 1956 was Bognor Regis. Don’t know if they owned the place or rented. correct, how did the title come to him? Just curious. Want to get my genealogy correct. I need the names and birth dates of Jeanie’s children. Only if you have a moment. Many thanks. I”l try to come to the gathering in Sept.
Geordie – my husband is the eldest son and he has a younger brother and sister, although I think “age” calls for discretion! I have tried some syrup ! I would love to visit Canada.. I have just completed adding ALL the Earls to my Legacy 9 database of family names. I was interested to note that all Herbert individuals have multiple middle names. I wonder why the parents did that. Question: is there a system for which names are included and/or in which order? On another note, I wonder if your mother-in-law – my cousin – remembers my visit in the summer of 1956 to their house in Bognor Regis? Long time. Kind regards to you both John.